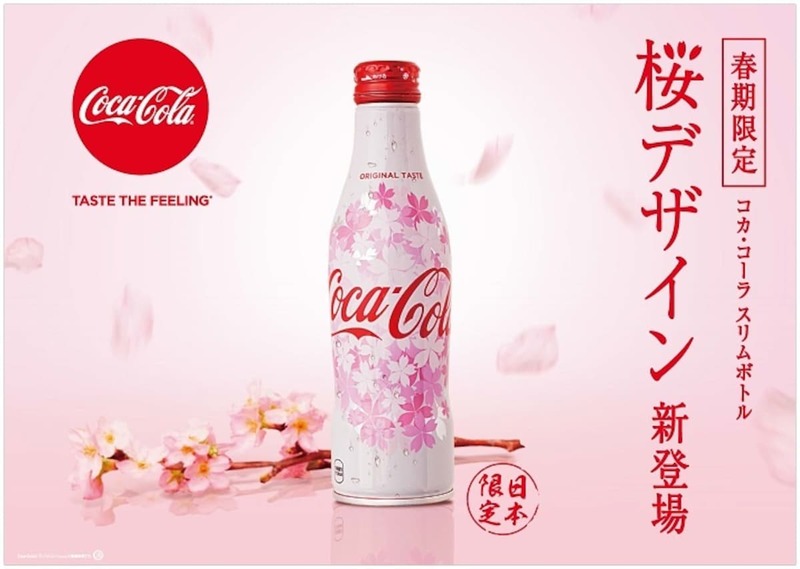 Following on from their special sakura design bottles released in 2017 and 2018, Coca-Cola Japan is continuing the seasonal tradition this year with another brand new cherry blossom design for 2019. Looking back at their previous bottles, we can see their first release featured a small cluster of pink blooms splashed across a plain white background. ▼ Then, in 2018, they amped up the design with much larger blossoms and a pale pink background. This year, they’re going with small blooms on a multi-colored background, adding in shades of pinky purples tones to the limited-edition design. Unlike previous years, which gave us close-up views of the flowers as we would see them on the branch of a sakura tree, this year’s version allows us to step back a bit and enjoy more of a hanami cherry blossom viewing scene. The top of the bottle is decorated like a flowery canopy, showing sakura in all stages of bloom, from unopened buds through to full blossoms and fluttering petals. At the bottom of the bottle, the flowers and petals fall gracefully to create a carpet of pink, reminding us of the fleeting impermanence of the season, and the limited-edition design itself. While the new bottle will be the perfect addition to hanami picnic baskets this spring, Coca-Cola also says the drink will be a great gift for friends during the Hina Matsuri Girls’ Day celebrations in March, and at graduation and entrance ceremonies in April. The new bottle will be on sale at stores around Japan from January 21, 2019, which gives us plenty of time to stock up before the predicted early arrival of the sakura this year.